I have put the patterns into the tutorial again, there are 4 "pictures" you will have to left click on now. When they were all on one page Paint would not let you enlarge unless you let it use more paper. I have also tried my best to explain how to save your patterns in Paint and re-size them. I hope this helps you. I am a miniaturist, not a computer specialist so I hope I made it clear. I did make this pattern twice from the patterns, you should be successful if you follow the instructions. Chris has had some problems with the pattern. You say you needed 5 pieces of foam core for the seat base, you didn't mention that you used any mat board. Did you use 2 pieces of mat board with your seat base? Did you glue the front and back to the 2 11/16" sides of the seat base? The front and back should NOT be glued to the 2 1/4" sides. I have to say I considered this tutorial for a long time before actually publishing it for this reason. I have to make changes with my patterns often, and I cut my foam core with a saw so there shouldn't be too much difference between pieces. Miniature upholstering isn't for everybody, there is a lot of making it fit, trimming and retrying. I would like more feed back on the pattern. Miniaturists, look to the left. I have many things listed that I refer to in the tutorials. This chair tutorial refers to the piping tutorial, "How to make piping for a pillow". The pictures at the end of the chair tutorial show where I glued the piping onto the chair. Please keep the comments coming, I enjoy them so much. Is that too conceited? It's so much fun hearing how excited you are. Seeing it is a revelation, isn't it? I know that's how I felt when I saw it for the first time. So much can come of this, have fun!!! CHAIR UPHOLSTERING TUTORIAL - How to make and upholster a 1 inch scale chair. Where do I begin? I began wishing for the beautiful furniture I saw displayed in Nutshell News so long ago. Always anxious for the next issue to be delivered, hoping that there would be an article in it with directions for making upholstered furniture. At last, July 1994, "Do it Yourself", page 94, Ray Whitledge publishes an article "A Sofa from Scratch". This is a very good starting place, it's where I started and I am thankful to Mr. Whitledge to this day. I am going to try to give you a starting place in this tutorial. I am using some of Mr. Whitledge's technique and I've changed the pattern. 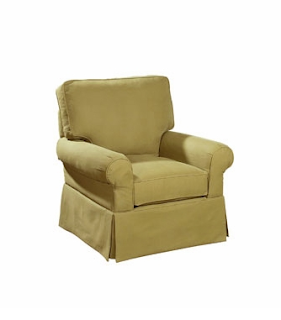 I started out today on Google Images, using the key words "living room upholstered chairs". Lots of images came up. For you, beginners, I began looking for a certain design: a skirt, no legs; no "T" cushions; simple lines. I know, "That's so boring, Kris." You've got to walk before you can run. You can do so many variations of this once you get used to making upholstered furniture. I found what I was looking for plus measurements. Measurements are very important and the more measurements listed the better off you will be. Full-size furniture measurements aren't chiseled in granite, that's to say you don't have convert your miniature exactly to the full-size measurements. Changes can be made and sometimes should be made. This started out to be a tutorial on drafting from full-size furniture. I started making changes to the pattern size, some just arbitrary, that's when I stopped and decided to give you a pattern and show you how to make a chair and let you go from there. Converting full-size measurements are certainly an excellent place to start. I recommend going out to a furniture store with your tape measure in hand and taking a few standard measurements like: heights of backs of different styles, side to side widths, widths of arms, width and depth of seats, height of arms from floor, height of seat cushion from floor and any others I may have forgotten. Take a few pictures if you can. Keep these measurements in a notebook for quick reference. Keep in mind that the full-size furniture we have now is a larger scale than furniture from the 19th century. Doll house rooms are smaller that our full-size rooms. With that knowledge we know that adjustments must be made. This is a picture of my "Ethan Allen" room box. I made mock ups of the furniture from poster board to see if I had to change the sizes. The pieces are just simple shapes representing the size. If I need to adjust, I know it now, not after I've spent hours making that special piece that just won't fit. I have a very good book to recommend, I hope it's still available, maybe there are used ones on Amazon. The name of the book is How to Build Miniature Furniture and Room Settings by Judy Beals. The front of the book says, "Techniques for building and modifying furniture kits, scratch building and upholstering furniture, and a step-by-step guide to building, decorating, and wiring a 19th century room box. That says it all, lot's of questions answered. This book has patterns for a wing chair and Queen Anne settee. She uses 3/16" bass wood for the body of the upholstered furniture, what a coincidence . . . . . foam core is 3/16" thick and you can use it instead. This is the chair I found to draft and build. I did change the back to an upholstered back, not a loose pillow back. Something you can do later. This pattern can be modified with a round top back, camel back, keep the square corners of the back but give the top of the back an arc; you can have the arms sweep out, you can make the rounded part of the arm larger; if you have access to legs you can make the seat base thinner and leave the skirt off and add legs; you can widen the chair to make a sofa; you can lengthen the seat to make a chaise; as always have fun, expand on it, make it better . . . . I did want to show you how I begin. I always write the conversion of 1 inch scale down. You would think after all of these years I would have it memorized, just lazy I guess. Before we start I want to talk about fabric. It is my opinion that the reason that a piece of furniture fails is because of fabric. There are lots of pretty fabrics out there, not so many for miniatures. Do yourself a favor and begin with simple cotton. I would even go so far as to say you should make the first chair from muslin to get the feel of doing this. I want you to be successful and that's the better choice for the first chair. I make all of the "first" pieces from muslin or white-on-white fabric just to see if everything is all right. I am not ashamed to say that there has been more than a few chairs in my garbage can because things just didn't work out the first time. When you do want to make the chair for a setting try looking at the quilting cottons first, something floral, not patterns that you will have to match. Think of the size of a 1 inch scale doll's hand for the largest size of the flower. Take your sample chair with you to drape the fabric on so you can see what the fabric will look like. Try to stay out of the other departments for now, you will fall in love with something that is, "Just the thing!" and it may be very hard to work with. Glue failure, raveling and fabric being too thick are just a few of the problems you could have. Save that for a little later. I could confuse you with more stuff, but I think you would be better served if I just started you building. Here are the pattern pieces. I put a lot of the information on the pieces for you. I print the pattern on card stock and keep the pattern pieces in zip lock bags with the name of the pattern on the bag. Load the pattern into Paint, I have a 1 inch square in the upper right corner. I have instructions for transferring the patterns at the left of the post, Things to do, Things to see, HOW TO RE-SIZE THE PATTERNS. I will attempt to write instructions for transferring these patterns to Paint. Left click on the top picture of the front and back. The picture will come up in a new screen. Right click on the picture. This will open a window. Left click on "Copy Image". Move the cursor down to the left corner of your computer screen, to your Windows start button and left click. This opens a window of your programs, left click on Paint. The Paint program should open up. In the tool bar left click on the "paste" icon. The picture of the front and back should appear. I did not have to re-size this pattern, the reason, I know not. I did have to re-size the others. I am going to go through the instructions to re-size. In the tool bar left click on the "select" icon. Draw a box around the patterns. In the tool bar left click on the "re-size" option. A window will open up. This can be a trial and error for a few times. Use percentage, not pixels. As an experiment type 50 in both of the boxes and left click on O.K. Print out your result. If it is not what you want, there are 2 arrows in the tool bar. These arrows point right and left, if you left click on the arrow that points left it will restore what you began with. Left click on the arrow that points left and restore your front and back pattern. 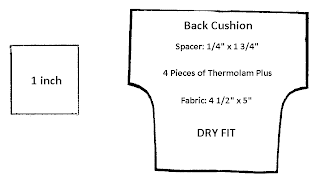 I have printed out the patterns and these are the percentages I used: the front and back printed out the right size; for the seat cushion and inside arm cover I typed 45 in both of the boxes; for the back cushion I typed 48 in both of the boxes. I don't know if you will use the same percentages. I hope this helps. If you can not do this print out the patterns and go to a photo copy store and do a trial and error there to get your sizes correct. We are going to make the seat base first. For gluing the chair together I use Tacky glue. Cut from 3/16 inch foam core 4 pieces 2 11/16" x 2 1/4". This foam core is available from Michael's. ALSO,Cut from mat board 2 pieces the same size. Michael's sell mat board back in the framing department. Apply the glue and I smear the glue by moving the pieces around on each other. Be sure you get the glue out to the edges. I used my square to make sure all of the pieces are lined up. Make sure you have good contact and all of the pieces are glued together. Trace the front and back onto mat board. Trace the front onto the back. We need to have the lines on the back to glue to that's in another step. This really matters when you have big sweeping arms and you need a line to follow. Cut your front and back out. Glue the front and back to the seat base. Glue them to the 2 11/16" sides. You should have a 1/16" of front and back left on each side. This extra is for the mat board sides to fit into. From 1/2" dowel cut 2 pieces to fit between the arms. Use tacky glue to glue the dowels into place. Use clamps to secure until dry. Supports for the arms are cut from foam core. Cut 4 pieces to fit between the arms and 5/16" wide. Glue the foam core together one on top of the other, from 4 pieces you now have 2. Glue the supports onto the seat base under the dowels. This supports the card stock cover we are going to glue on next. This is your arm cover pattern. I've put "Dry Fit" on this. You need to always dry fit the pattern first, see if you need to make changes. You are not machines and your chairs will not always be cut out the same, there will be small differences in every chair. 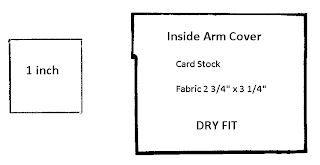 I am trying to show you how to curve the arm cover card stock pattern. If you curve it first by pulling the pattern over the edge of the table with your hand on it, it will curve without creasing. You can get a good curve. Dry fit the pattern. Take note of any adjustments you need to make when you draw your actual arm covers, don't change your pattern. 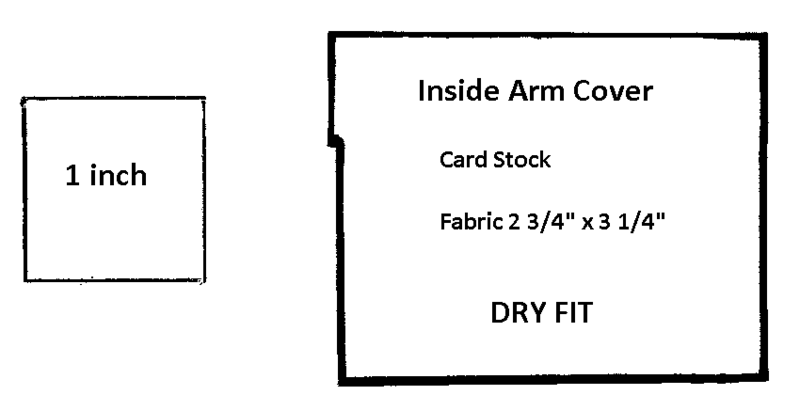 Trace the arm cover pattern onto card stock and cut out. Here are my arm covers. Curve them and dry fit again. Apply and smear the tacky glue onto the supports, dowel, back (on the line) and on the front edge. Glue the card stock arm covers onto the chair. If the foam core supports were not under the dowels the arms would be very delicate and easy to mash when we upholster. I do not give a pattern for the sides. I use mat board for the sides. Place a strip of mat board up to the side of the chair under the dowel and behind the front. Trace along the bottom and back of the chair. I've measured 1/16" in on one side, this is the thickness of the back. The mat board has to fit between the front and back pieces. Apply glue to the seat base, front, back and under the dowel and glue the side onto the chair. This is my sample chair, I used white-on-white fabric to cover it, like muslin it is easy to work with. I also dye the white-on-whites, you get a very pretty tone-on-tone fabric. I use Rit dye. "Why is Kris showing us a rag in a sour cream container?" This is a wet wash cloth, keep it handy for wiping glue off of the fabric and your hands. For a bottom cover set the chair on card stock and trace around the bottom. This is the side that is going to be glued to the bottom of the chair, mark it, mark the front. Cut it out. I use this glue stick to glue the fabric to the card stock. I have found that a sheet of photo paper is great for using as a mat when I apply the glue to the card stock. I can go over the edge and get glue onto the photo paper and the glue dries and I can use the photo paper over and over again, as you can see. The glue doesn't dry fast enough if you use regular paper, it stays sticky. Turn your bottom cover over and apply glue stick. Press your card stock bottom cover onto the wrong side of the fabric. Trim around the card stock. Apply tacky glue to the bottom of the chair, smear it around to cover the whole bottom. Line up your edges and glue the bottom cover onto the bottom of the chair. Smooth the bottom on with your hand. Apply tacky glue to the chair and fold up the extra fabric. I use Thermolam Plus for the batting or padding in my furniture. I buy this from Joann's Fabrics. Joann's usually keeps it by the cutting tables in a rack with the quilt batting. Measure the length of the arm and cut the Thermolam Plus this width. Cut it long enough to go from the seat base over the dowel to just under the dowel. Apply and smear the tacky glue onto the card stock arm cover. Lay the Thermolam Plus onto the arm cover. The Thermolam Plus is glued to just where the dowel stops. Both pieces of Thermolam Plus are glued on. Cut 2 pieces of fabric 2 3/4" x 3 1/4". On the wrong side measure 1/4" on one long side and draw a line. Cut "V" notches to that line. Match the line you drew to the back and glue the end to the side up under the dowel. I have glued both pieces of fabric onto the sides. I have taken a picture of the glue on the back and seat base before I've smeared it so you can see where I have applied it. Be sure to smear the glue to get an even coat and no glue oozes out where you don't want it to. Pull your fabric over the top of the arm, pull tightly and press down into the glue. Apply tacky glue to the back and press the fabric into it. If you are finding you have too many wrinkles around the dowel lift the fabric off the side and pull a little bit and re-glue to the side. This should take the extra fabric out. Make a diagonal cut to the corner of the seat base. Showing what the diagonal cut should look like. Cut "V" notches around the dowel. Apply tacky glue to the front and glue the extra fabric down. In this picture I am showing how I pulled up the fabric from the side and pulled on it a little bit to take the extra fabric out and could smooth the notches around the end of the dowel. You will also have trouble getting the notches to glue down if you have any of the Thermolam Plus hanging over the edge. The fabric has been glued onto the arms. There are other ways of finishing the front of the arms, like accentuating the gathering but not today. Cut a strip of foam core 1/4" wide and 1 3/4" long. This is the spacer for the back cushion. Glue this piece into the back of the chair. This will make your back cushion slant and look comfortable. Measure the length of the side of the chair. Measure the height of the side of the chair. 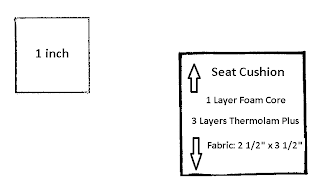 Transfer your measurements to card stock and cut out side covers for your chair. Apply glue stick to the card stock and press the side cover onto the wrong side your fabric. Trim and cut the corners like I have. Apply tacky glue to the top and bottom and fold the extra fabric over to secure. *Just a reminder, when I say apply tacky glue, I want you to smear and smooth the glue so you don't have any glue oozing out, even if I don't write in the directions. You do not need to smooth the glue stick. Apply tacky glue to the side of the chair, be sure to smooth the glue out before you apply the card stock side cover. Smooth the side cover with your hand. Apply glue to the front and back of the chair and press the extra fabric onto the glue. Trace the front pattern onto card stock for a front cover. Cut the front cover out. Apply glue stick to one side and press onto the wrong side of fabric. Trim the fabric like I have done in the picture. Apply tacky glue to the card stock and fold and glue all sides but the top that will be glue onto the seat base. Apply tacky glue to the front of chair and press the front cover onto it. Apply tacky glue to the top of the seat base and glue the extra fabric down. Dry fit the back cushion pattern and make note of any changes that should be made to the final back cushion. 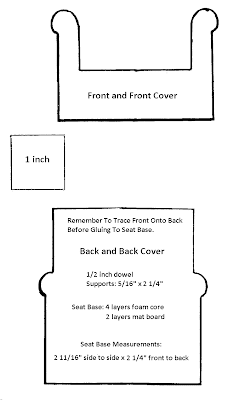 Trace the back cushion pattern onto 1 layer of foam core and cut out. I am carefully bending the top mat board back to tip it out. I know most of you don't have the machines to cut the angle on the seat base as I would have done. This little bend makes the chair look not so boxy from the side. There will 4 layers of Thermolam Plus on the back. Cut out a piece of Thermolam Plus the size of the back cushion and trim off about a 1/4" all around. The second pieces is even all around except at the bottom, it's still 1/4" shorter. The third piece is even all around. Apply tacky glue to the back cushion and glue the Thermolam Plus onto the back cushion starting with the smallest, second and then the third piece. The fourth piece is cut even with the bottom and around the arms. Leave extra at the sides and top to glue onto the edge of the foam core. Apply tacky glue to the edge of the foam core and press the Thermolam Plus onto it. Trim corners and trim even with the back of the foam core. Cut a piece of fabric 4 1/2" x 5". The 5 inches is going from the top to bottom of the back cushion. Trim the fabric like I have done in the picture. Use tacky glue to glue the extra fabric at the bottom onto the back cushion. Trim as I have in the picture. Glue the extra fabric into the arm area. Don't worry if your fabric doesn't come over to the back, as long as you have fabric glued to the side of the foam core the raw edge will be hidden. Apply tacky glue to the top of the back and to the side of the spacer. Put your back cushion into the chair. Square corners used to be a problem. I want to show you a nice way to finish them. Glue the sides of the fabric to the back of the chair. I show the top glued down, too, and I do that but this method lifts and glues a couple of times so if you want you can leave the top un-glued for now since the top isn't long like a sofa would be. Fold your fabric over like I have mine, pull tight. The corner isn't folded exactly like you would a present, but close. Bring the top over, also bring some of the fabric from the first fold to get the final fold on the corner. It won't have a diagonal fold like the end of a wrapped present. Stick a little glue into that fold. Trim out all of the extra fabric. Glue down the top of the fabric. Be sure to trim out the bulk. This is a perfectly acceptable finish for square corners. I will use this on upholstered seats, the ones without a cushion. Dry fit the back pattern and make note of any changes you need to make on the final back cover. Trace the back onto card stock for a back cover and cut out. Apply glue stick to the back cover and press onto the wrong side of fabric. Trim around the back cover like I have shown in the picture. Apply tacky glue to the card stock back cover and fold the extra fabric over and glue down. Glue the back cover to the back of your chair. Some of you might not like the seams showing. If you don't this is the time to add boxing to the back. Measure the width of the corner. Do not include the back cover. You want the boxing to be glued just next to the back cover. I measured 3/8". I drew my lines on the wrong side of the fabric and I will cut the strip out. I applied a little glue into the seam where the side of the back meets the top of the arm. I used a toothpick to push the end of my boxing into that seam. Apply tacky glue to the edge of the back cushion, smear smooth and press the boxing into place. Do not pull any loose threads, cut them. Make sure the boxing is glued all along the edges. You can glue piping or other trim along the raw edge. 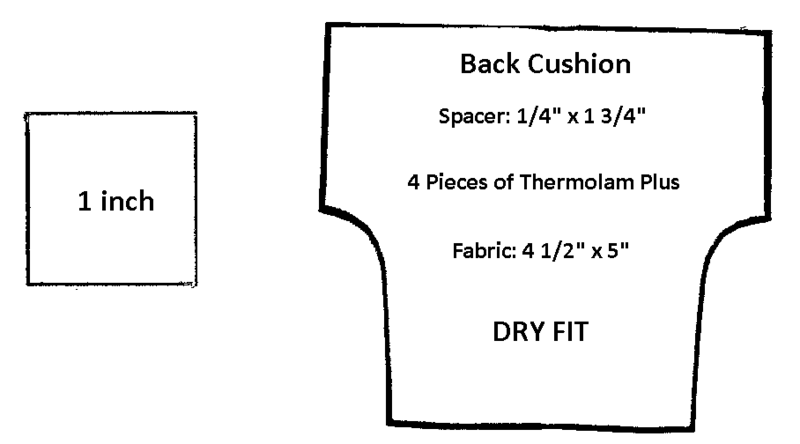 Dry fit the seat cushion pattern and take note if any changes need to be made. Trace the seat cushion onto 1 layer of foam core and cut out. Dry fit the seat cushion. 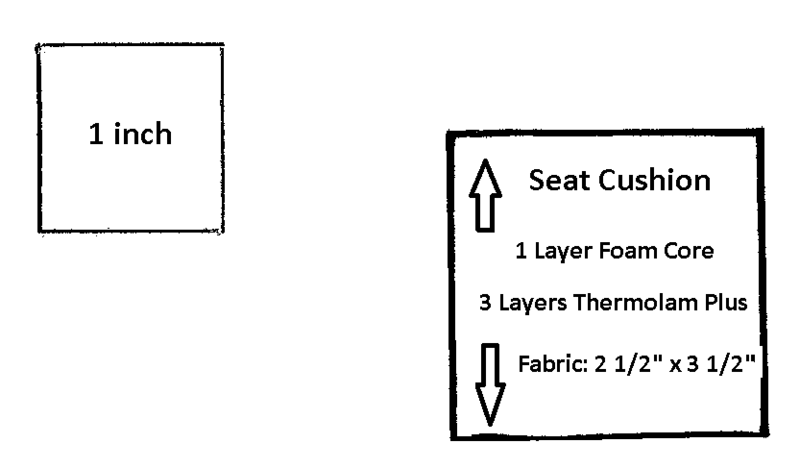 There are 3 layers of Thermolam Plus on the top and 1 layer on the bottom of the seat cushion. Cut the first piece 1/4" smaller all around and the second piece is cut even all around. Use tacky glue to glue the Thermolam Plus onto the seat cushion starting with the smaller piece. Cut a strip of Thermolam Plus the width of the seat cushion. This is glued to the bottom of the seat cushion. Bring the end of the Thermolam Plus up the front of the seat cushion and onto the top. Trim the Thermolam Plus even with the sides and back. Cut a piece of fabric 2 1/2" x 3 1/2". Use tacky glue to glue the extra fabric from the front and back to the bottom of the seat cushion. Apply tacky glue to the fronts and backs at the ends. Smear some of the glue onto the fabric. Fold the extra fabric over just as you would when wrapping a present. Press the little "ear" of fabric left at the bottom. Get the fabric glued together. Only do this on the bottom of the seat cushion. You are looking at the front of the seat cushion, you can see the fullness from the Thermolam Plus. You can also see the little "ears" at the bottom that I have pressed together. I haven't folded the top down, yet. I have applied the tacky glue, I haven't smeared it, yet. Smear it into the tips that will be the top corners. This is a side of the seat cushion. I have cut off the bottom "ears" of fabric. The piping will cover that seam. Apply a little more glue into that top corner fold a press together with your fingers to make it less noticeable. Measure the corner of the seat cushion for boxing. I know this looks like it's almost a 1/2" wide. It looks better if you cut the boxing less than that. You can experiment, but I usually cut my at 3/8". Cut the boxing just like you did for the back cushion. Glue it on using tacky glue. At this point I add my piping. I have a tutorial showing "How to make piping for a pillow" in the listing at the left. Cut card stock strips 11/16" wide for the skirts. I usually have my piping on at this point, my fault, I forgot. You will see piping on the chair in the pictures after I show you how to make the skirts. So make believe I have piping on the front and I've set my card stock strip up to the front to measure the length for the front skirt. Cut the card stock to the length of the front. Apply glue stick to one side and press onto the wrong side of your fabric. Trim the extra fabric as I have in the picture. Apply tacky glue to the card stock and fold the extra fabric over to secure. How did that piping get there? Apply glue to the top edge of the skirt and smear smooth and press onto the front of the chair. Set the strip of card stock up to the side of the chair and measure the amount you need. Cut it and apply glue and fabric. Apply a line of tacky glue to the top edge, smooth it out. Glue on the side skirt. Measure for the other side. Cut the card stock, apply glue stick and fabric. Glue the side on. Measure for the back last and repeat what you did for the rest of the skirts. When you have the all the skirts on you can apply piping to the top edge of the skirts. Here are pictures of the finished chair. I hope you give it try. Have fun, expand on it, make it better . . . . . . . . Just keep making minis!